Andrea Bell Wolff - Call on Dolly! Andrea Bell Wolff confesses that she practically had a career in Hello, Dolly! Over the course of several years starting in 1967, she started with Carol Channing, as Ermengarde at the age of seventeen, in Carol’s FIRST national tour three months before the tour ended. She came in as a replacement for the previous Ermengarde. This was in Rochester, New York. She would eventually graduate to Minnie Fay, a role she says she would continue to play if they would allow Minnie to become a spinster! Andrea had auditioned for Channing’s tour when it was first heading out. It got down to three girls for Ermengarde. One of the other girls got the part. When she was leaving the tour, Andrea’s manager, Murial Carl, got the call. Andrea auditioned again and got it! She was still in high school, the Professional Children’s School. Andrea remembers getting the phone call in the afternoon that she had gotten it. She was on cloud nine and remembers floating to her manager’s office. A week later, she was on a plane with another guy who was also going into the show. He was the replacement for the headwaiter. He, unfortunately, would not last as long as Andrea. He got fired. In rehearsals, Carol wasn’t happy with his portrayal. That company included Milo Boulton as Horace Vandergelder, Isabelle Farrell (Minnie Fay), Don Slaton (Barnaby Tucker), Barbara Shannon (Ernestina Money), Jim Sanderson (Ambrose Kemper), Charles Scott (Rudolph). Peter Walker (Cornelius Hackl). Henry Sutton (The Judge). Andrea feels that she was a good Ermengarde and a really good Minnie Fay. She certainly has the reviews to prove it. Before going on the road, Andrea went to see the Broadway production, standing room only to see Alice Playton in the role she would be playing on the road. That was the first time she heard the score. On her opening night in Rochester, Carol Channing was so good to her. Unbeknownst to Andrea, her father had flown up for the opening. He didn’t let Andrea know and when he went to the box office, there were no tickets. They allowed him to stand in the wings which Andrea also did not know. During the curtain calls, Carol took Andrea by the hand to take a bow with her. Andrea got a special bow and the company applauded her. This was Andrea’s first professional job and to be taken by Carol’s hand was a special welcoming. The first thought that comes to Andrea about Carol Channing is her uniqueness. To Andrea, she was the best of all the Dollys she appeared with. She said others came close to owning that part, but not to the level of Carol. NO ONE was ever able to replicate what Carol brought to the role. Her timing and everything. Phyllis also did a great job. Dorothy had a huge fan base from the Road pictures she did with Hope and Crosby. She said along the way she would continue to tweak her performance but nothing outside the confines of what was required of her. Otherwise, that would throw off the other performers. She never wanted to be the person that people would say, “Can you believe she did that?” She was not the star and remained true to what she was doing. Just before that tour ended, Andrea got a call that Alice Playton who was playing Ermengarde on Broadway with Betty Grable, was leaving to do Henry, Sweet Henry, and they wanted Andrea to come in and replace her. Andrea quickly went into that production which included Max Showalter as Horace. June Helmers was Irene Molloy continuing from Betty’s tour and Riviera run. June and Andrea became very good friends. Sondra Lee was Minnie Faye, eventually being replaced by Leland Palmer. Andrea understudied Minnie Fay in addition to playing Ermengarde. Harvey Evans was Barnaby. Gordon Connell, continuing on from the original production, was The Judge. Judith Drake, who had done the International tour with Mary Martin, was Ernestina Money. Andrea and Judith also became very good friends. Will McKenzie was Cornelius Hackl. Leland Palmer eventually left to do How Now Dow Jones allowing Andrea to step into the role. That company closed when the Pearl Bailey/Cab Callaway company came in. At that point, Andrea went out with the Dorothy Lamour company for a year. This was a bus and truck company. After Pearl Bailey’s company closed, a new company was being formed for Broadway starring Phyllis Diller and Richard Deacon. Andrea got a call to come in and sign her contract. As stated, she had been on the road. She had even gotten a call from Twentieth Century Fox to audition for the film. She was appearing in New Mexico when that call came in. She was flown in to screen test for Minnie Fay. (The role eventually went to EJ Peaker). She received great reviews on the road and was anticipating her return to Broadway AND with Phyllis Diller! When she showed up to sign her contract, she was informed that someone else had been hired to play Minnie Fay! They still wanted her in the company as Ermengarde!! The actress who got the part of Minnie Fay was Georgia Engel. Of course, Andrea was disappointed…but she stepped up to the plate, swallowed her pride, and accepted the part of Ermengarde. That production also had Danny Lockin as Barnaby Tucker. He also played Barnaby in the film version. Ron Young was Ambrose Kemper. Marcia Lewis was Ernestina Money. She also became a very close friend of Andrea’s. It also featured Bill Mullikin as Cornelius Hackl, and June Helmers as Irene. That production ran three months before Ethel Merman came in. By this point, Andrea had auditioned for another show, in Vegas, and would not stay throughout Ethel’s run. She had already given her notice. She did rehearse with Ethel and did two weeks with her. Andrea says that when Ethel arrived, everyone was scared to death! They had been a company that had been working together for several months. The day that Ethel came into rehearsals, everyone was so quiet. It was Ethel Merman! Andrea would get the chance to revisit Dolly several years later on a summer tour with Betsy Palmer. Max Showalter was Horace in that tour. June Helmers as Irene Molloy. June, unfortunately, passed away at a very young age. John Bennett Perry was Cornelius Hackl. He is the father of Matthew Perry of Friends fame. They always played big houses and the houses were always filled. At the end of the night, as I am repeatedly told, Carol would rent out a movie theater for the cast and crew to see first-run films. She also served refreshments in the concession stands. Charles did not allow Carol to be “one of us”. He always made sure that she was somehow kept separate. Andrea feels that that was unfortunate. Somehow, she feels that Carol would have loved hanging out with the company. Charles kept Carol in a bubble. Another highlight took place in her first national tour with Carol. They went to the world’s fair in Montreal and were treated like royalty. The Indian Embassy threw a party for the Dolly company. Her mother designed an Indian dress for her to wear. Although Andrea was seventeen, she got very drunk. Something was said to her in French. She responded by saying with a French accent, “Kiss my tuchus.” Everyone at the table was, obviously, horrified. Another incident happened also on Lamour’s bus and truck company. They were in some town and saw that someone was selling puppies. So, Andrea and her roommate decided to adopt two puppies AND take them on the road with them. The two puppies ended up eating the shower curtain in one hotel they were staying in destroying a couple of other hotel rooms in the process. They had to eventually give the puppies away. It was costing more to take care of these puppies than what they were making! The puppies were also running up and down the aisle on the bus and barking and peeing and throwing up. Because she was so young, Andrea would fall in love at every stop! She would meet some really cute boy and she was smitten. She was constantly falling in love. That’s what Dolly is all about. As they were departing each destination, she would be weeping and wailing that, as she left these boys behind, her heart was broken. The older cast members would roll their eyes and think, “Well, that’s what happens when you are seventeen.” Andrea says that when you are that young and on the road, you see the world through rose-colored glasses. It was a dream come true for her. Once on the road, Andrea got very sick. She ended up in the hospital, and the company had to leave her behind. She ended up going home for a while. Her understudy, Judy Jensen, took over during Andrea’s absence. This was all due to exhaustion. There was no downtime when you were on the road. You practically lived on the bus. You’d get up early in the morning, get your suitcases packed, get on the bus to your next destination which usually around dinner time. You had dinner and then went over to see what the stage was like. You never knew what to expect! Andrea says one timetable tops were literally put together. The next night, you would have your dinner, go to the show, go back to your hotel and go to sleep. On opening nights, there was usually an after party. This was an opportunity for the sponsors to meet the cast. Sometimes, it was just a one-night appearance and they would be on the bus and on to the next destination the next morning. Andrea recalls that on those occasions, there were usually hung over cast mates stumbling to the bus on those mornings. Everyone tried to be especially quiet to compensate. There were some pretty scary times, as well. Remember, this was the 1960s. Sometimes in the south, when the cast would pull into a restaurant and get off the bus, there was a prejudice against gays. If the restaurant owners perceived that someone was gay, they would not be allowed into the restaurant. Sometimes, the bus would be pulled over by the state police. They were just curious as to who was on the bus. The more flamboyant guys in the company would literally hide. Dorothy would not be with them. She and her husband had their own car. Andrea says she loved all of her Barnaby Tuckers. When she was on the road with Dorothy, it was Jess Richards. She also worked with Danny Lockin. Danny, of course, recreated the role on film. Andrea was unhappy with the film choice of EJ Peaker for Minnie Fay. Andrea finds her very “white bread.” Andrea was “a little bit more New York-y. “. Andrea finds EJ the very opposite of that. She didn’t seem like a New Yorker to her. Her experiences with Dolly were ninety-nine percent positive. Her only disappointed, stated earlier, was her disappointment of coming back to Broadway as Ermengarde instead of Minnie Fay. She loved all the Dollys she appeared with. She did have one experience with Betsy Palmer in which she was asked to cut her scream after discovering Cornelius in the wardrobe in the shop scene because it was stopping the show, meaning getting a huge laugh. Andrea says other than those she has shared a stage with, she has not seen anyone else play Dolly. I asked Andrea if she thinks Dolly would succeed in the twenty-first century if it was a fresh and new production. Andrea says in her mind, yes, although the theater is very different today than when she did Dolly. Broadway now tries to appeal to a much younger audience. In today’s world, who would she like to see play Dolly? Lady Gaga. Andrea says she doesn’t feel that she will ever have an experience again as wonderful as Dolly! She has done a lot of shows that have been wonderful and great but nothing that compares to Dolly. As you get older, you look at things through different eyes. She was very young when she did Dolly so that sparkle was always there. 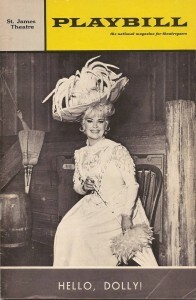 She also admits that when she was doing Dolly on Broadway, she was very lonely. She had an apartment around the corner from the St. James and spent a lot of alone time there. Everyone was much older than her and she didn’t really have anyone to hang out with. As far as Jerry Herman is concerned, Andrea never worked with him. She worked mostly with Lucia Victor and Jack Craig. Andrea would work with Lucia again when she portrayed Josie Cohan in a production of George M. Lucia directed and once on the road, said, “ All I can say, Andrea, is thank God we cast you!” That production was headed by Hal Linden and Suzanne Casino. According to Andrea, it was just an ok production. The biggest change that Andrea has seen in the business since first doing Dolly is that today there seems to be more EXTREMELY talented people vying for jobs. For every thirty talented people that were seeking employment when she started, by today’s standards, it is probably about three hundred. Nowadays, they are ALL taking acting, singing, and dancing lessons at a very young age.